Tell me why, before any important event , function or wedding , a pimple pops up. Happens all the time with me girls, but do you know pimples do not pop up all of a sudden , they are white heads that eventually come out as big ugly pimples. 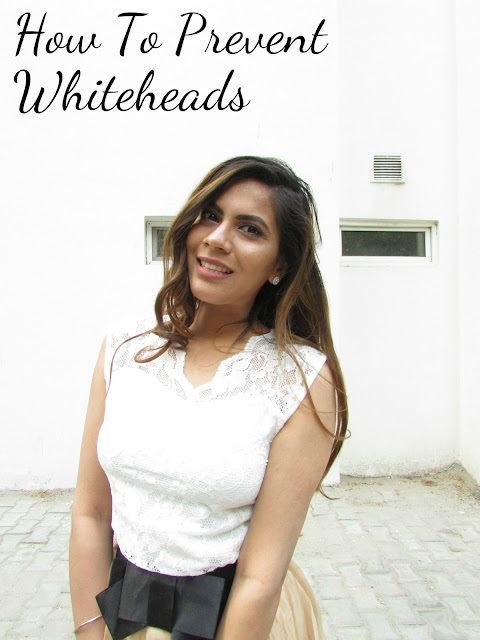 So today we are going to talk about how to prevent white heads. Don't you think it's important to work on the root cause if the problem and that's what we are going to do, try to minimize those white heads that take shape of those ugly looking yellow pimples. So let's see how we can prevent those white heads from getting into the pores. 1) Wash your hands before touching your face. Germs can increase white heads. 2) Keep Face clean, wash it twice a day, morning and evening to prevent oil and dirt building up in your pores. 3) Exfoliate atleast on a week to remove dead skin that cold your pores. 5) So these are some simple ways to prevent white heads and eventually get rid of pimples. Oil based cleansers, moisturisers and makeup aggravates acne and pimples . 5) Makeup clogs the pores and contributes to white heads so make sure to remove makeup as best as you can. These are easy ways to prevent white heads and eventually prevent pimples. Hope you found it helpful. Great tips! I always make sure to exfoliate - it makes a big difference! great post Pooja! Kisses Mandira! Blackheads and whiteheads are a pain. Thanks for sharing these tips Pooja.